The winners! The losers! The chat room! 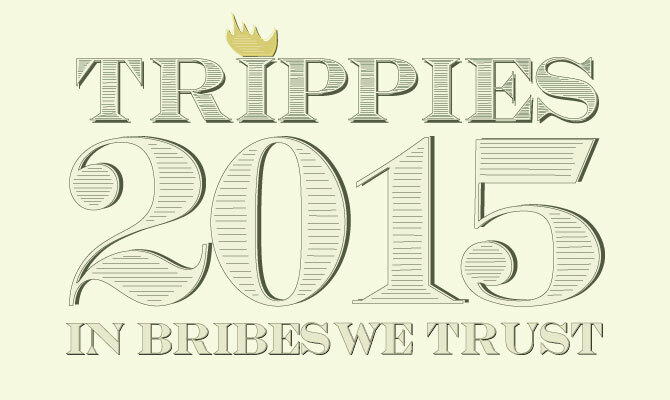 The #trippies2015 hashtag! The drunk shenanigans! and VEGAS VEGAS VEGAS. Starting at 7:11pm tonight we announce the winners of the The Trippies 2015 and LIVE webcast! Watched two hours of the broadcast last night...love the dog! May I suggest that maybe, possibly you could tighten up the show a little by not commenting on everything? I would have listened to the whole thing but it was after midnight in my area and you were still only halfway through. Also keep in mind there are many Vegas lovers (like me) who can't afford a high end Cosmo/Wynn/Bellagio experience. I am grateful that the Harrah's,Linq, Flamingo area exists and offers me a fun time without a huge price tag. Anyhow...thanks for the show and all the work it entails. The Trippies webscast has always been a less than formal, loosey-goosey sort of an event. Tightening it up kinda runs counter to the spirit of the site. I sincerely appreciate the constructive thoughts. We've got 86 categories to go through, and every one is the most important one somebody tuning in. Spending one minute on each means we're at 90 minutes with zero discussion. Two minutes makes it 3 hours. We came in at 2 1/2 hours, splitting the difference with added variance for live recording technical problems that happened during reading the dining awards. Other than reading the awards winners, this event is unscripted and improvised - only I know the winners beforehand. As a result, when other editors act surprised - as I'm sure the readers do - we discuss why. As the ringmaster, host and doer of the work, I wholeheartedly agree that it is a very very very long night, the giant cherry on top of two month process. Lastly, we had people tuning to the webcast from all over the world - throughout the United States, Canada, parts of Europe, Australia, New Zealand, Japan and Macau. For some of these folks the timing of the show is thoroughly inconvenient - 2am, 7am, 11am, 10pm. There is no easy answer here, but my philosophy is that the awards show - like a night in Vegas - is gonna go late and get crazy. I have ideas to prune and adjust the categories for next year, which will surely make a bunch of folks upset, but right now I need to sleep for a week. I don't mind if it's necessary to punt in some categories. The webcast and the shorter write-ups were quite well done - but I must say, what was with the slap at cocktails? None of the editors had any positive opinions about the mixing of drinks, anywhere in town? I'll admit, that was unexpected. @butler, the editors choice wasn't saying that mixology is sub par, the opposite is true. we're just tired of it... booze is booze. the cocktails category is probably going away next year.